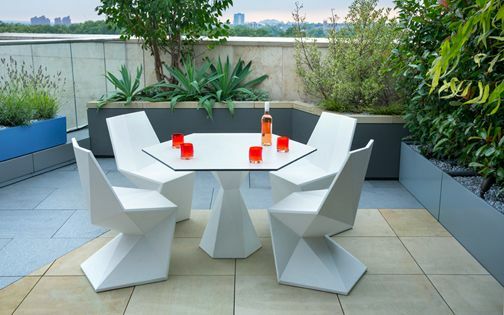 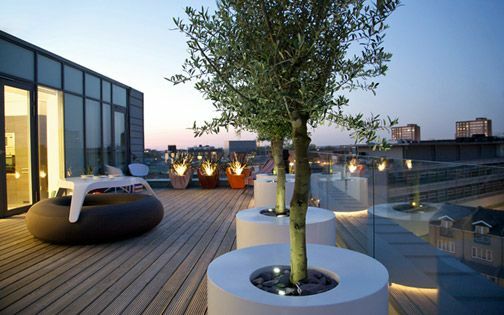 Tucked away snugly behind EC2's Great Eastern Street and Curtain Road, this Shoreditch roof terrace forms part of two outdoor spaces which envelop a creatively modernised penthouse apartment. 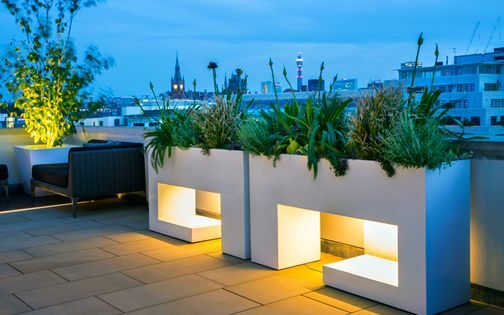 North-facing and secluded, the roof terrace functions as the home's main alfresco hub, and features shade-loving plants in a minimalist array of customised powder-coated planters. 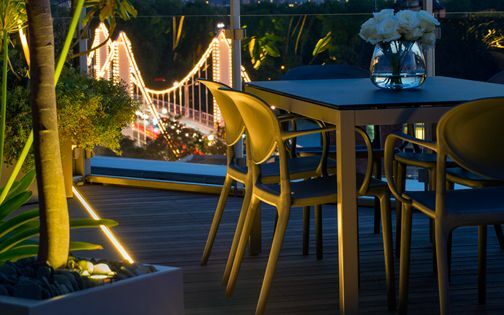 The interior's arched ceiling is echoed by streamlined curved vases, while flamed granite pavers and Ipe hardwood decking merge with the apartment's flooring to produce a fluid indoor-outdoor continuum – amid a tranquil terrace design. 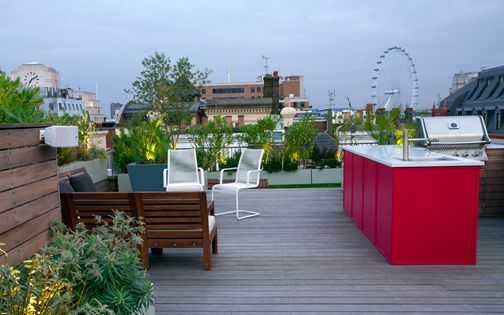 Following the apartment's extensive refurbishment, its elongated roof terrace required varied zones to maximise renewed architectural flow. 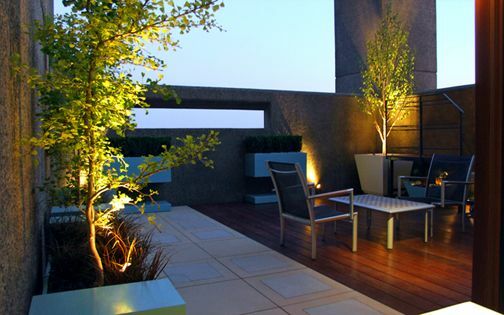 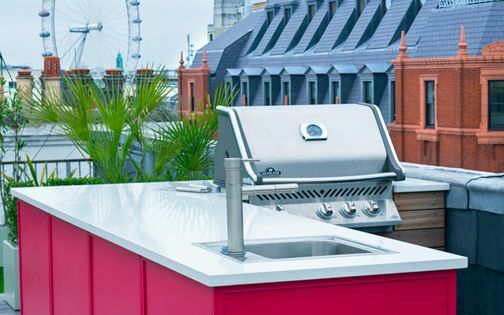 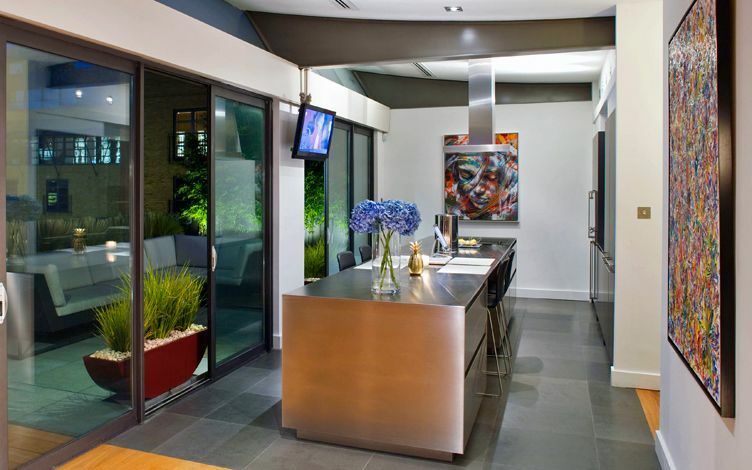 The kitchen's granite tiles were reproduced outdoors with a matching layout, and Walnut flooring was continued into Ipe decking – creating an integrated rooftop garden. 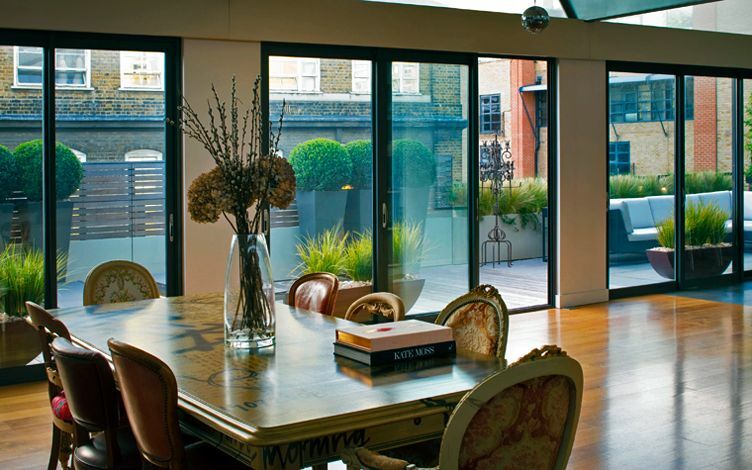 The terrace gained a greater sense of depth, further balancing a vast open-plan living room with sculptural foliage and multilayered architectural focal points, where the design's distinctive geometry infuses a lavish, modern Shoreditch penthouse apartment with pivotal, dynamic movement; its minimalist textures soften a state-of-the-art interior, while extending valuable exhibit space for our client's flourishing contemporary art collection. 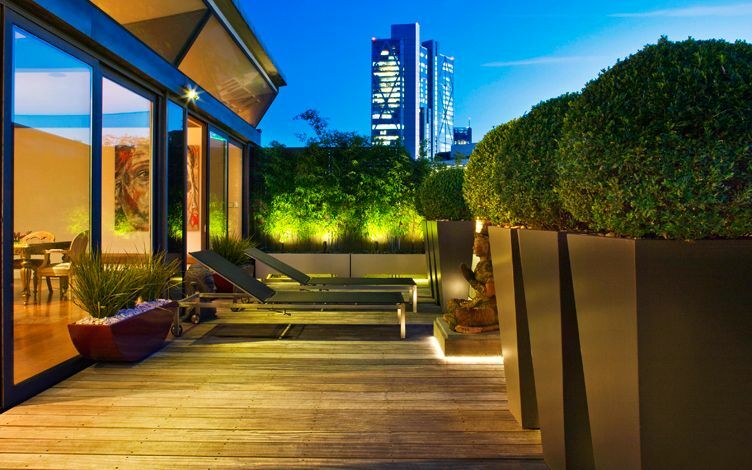 Further privacy was paramount to enhance seclusion towards nearby office buildings. 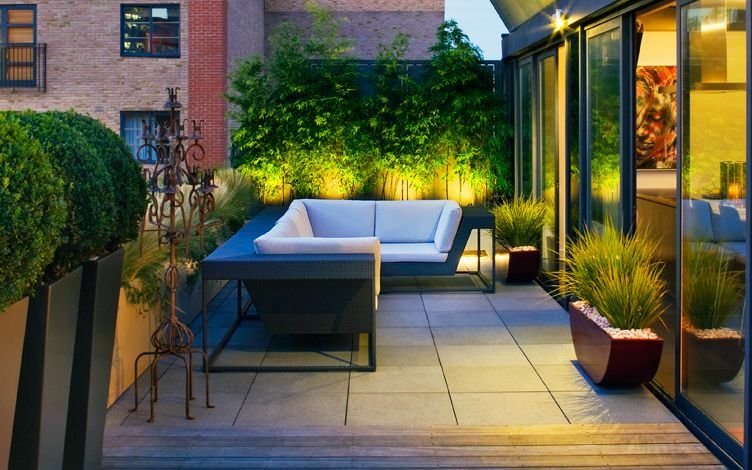 We constructed a well-fitted, hardwood-clad screen above the terrace's balustrade, providing a solid linear backdrop for large-scale planters featuring Box spheres. 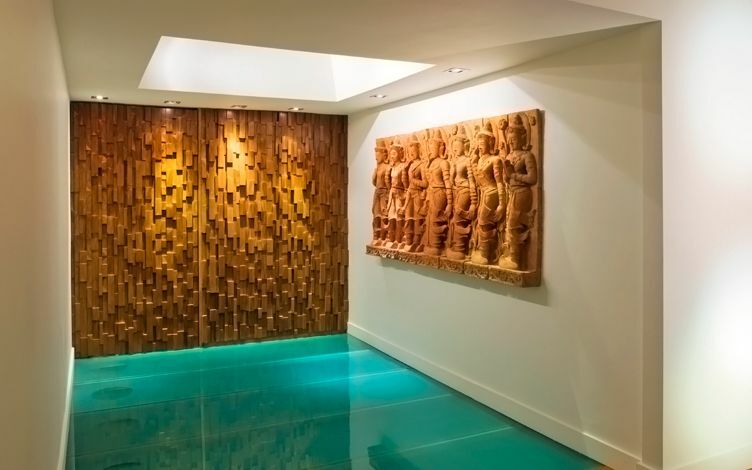 Bamboos produce a soft veil along the rooftop's side boundaries, displayed in raised, recessed troughs and lit below, as a terracotta Buddha sculpture rests between two planter trios, forming part of an eclectic art collection. 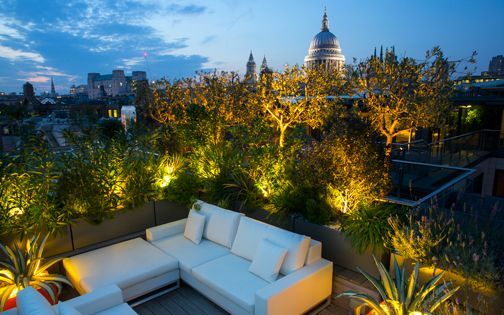 While the south-facing roof terrace is designed to maximise panoramic London vistas, facing Shoreditch High Street, in this intimate rooftop terrace, outdoor privacy is appreciated in peaceful quietude within proximity of kitchen amenities and remote-controlled penthouse gadgetry – well secluded amid Shoreditch's urban hustle and bustle. 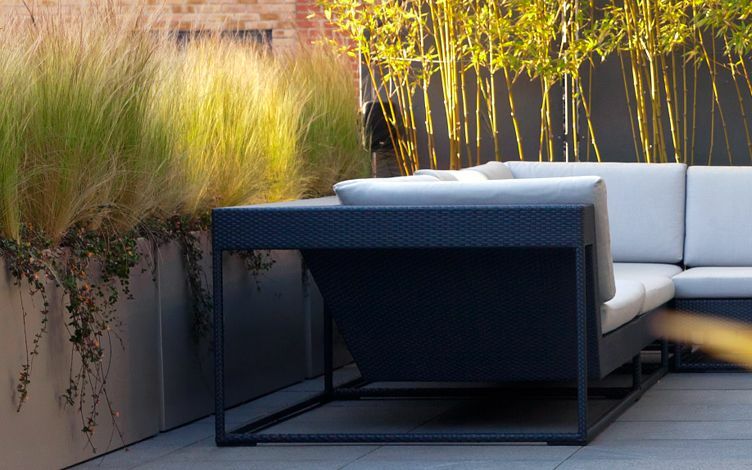 To complement the delicate tones of natural wood and stone, we utilised a vibrant planter colour palette, with burgundy red, deep slate and white – enhancing outline contrast. 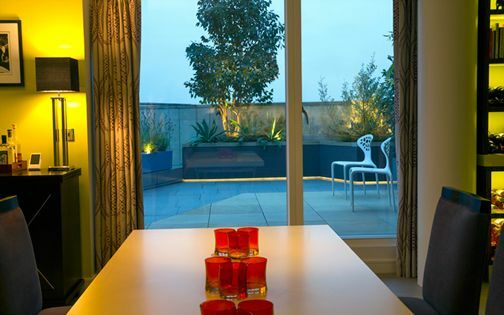 A layered, evergreen planting scheme alternates between four large sets of glass doors, varying in height from low curved vases to tall tapered squares. 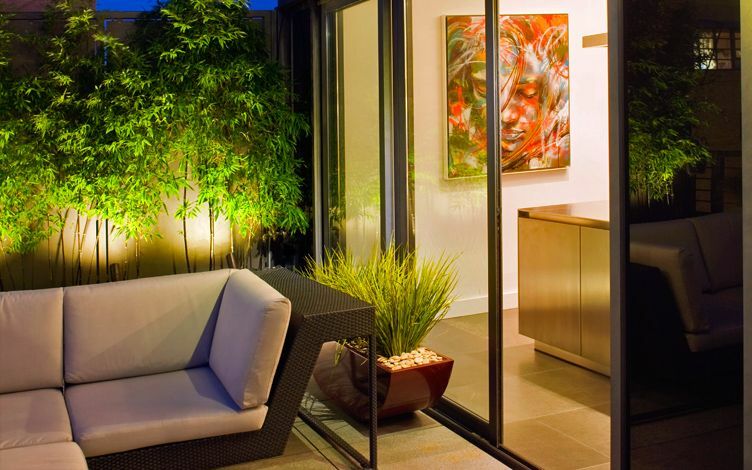 This design methodology transforms indoor-outdoor views, and inversely, partitions the long and narrow terrace into versatile zones. 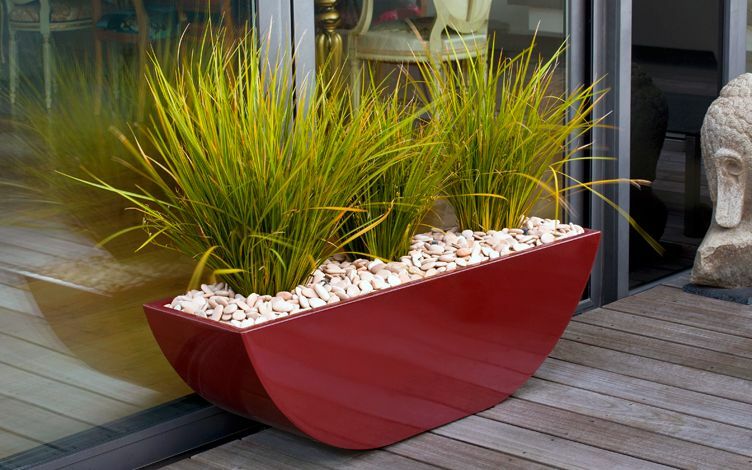 The warm orange tones and soft texture of grassy Libertia ‘Goldfinger’ from New Zealand emphasise vivid definition alongside verdant, spherical Box topiary, forming distinct silhouettes, while requiring unfussy minimal upkeep, and effortlessly sustaining a roof terrace design fusion. 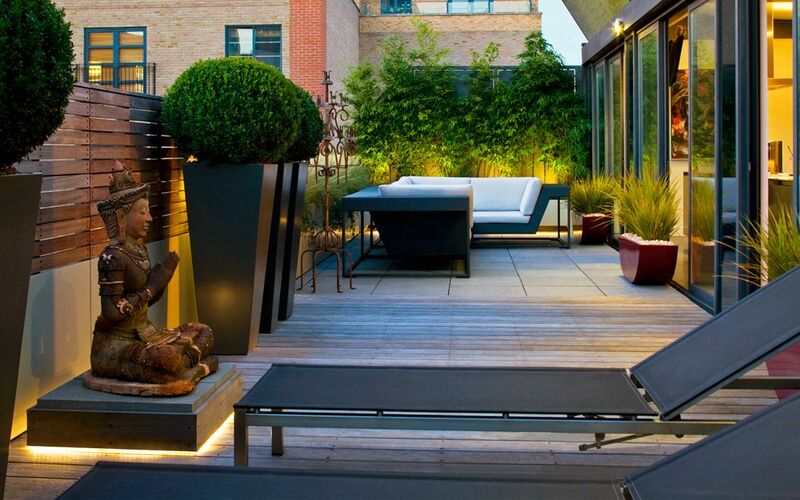 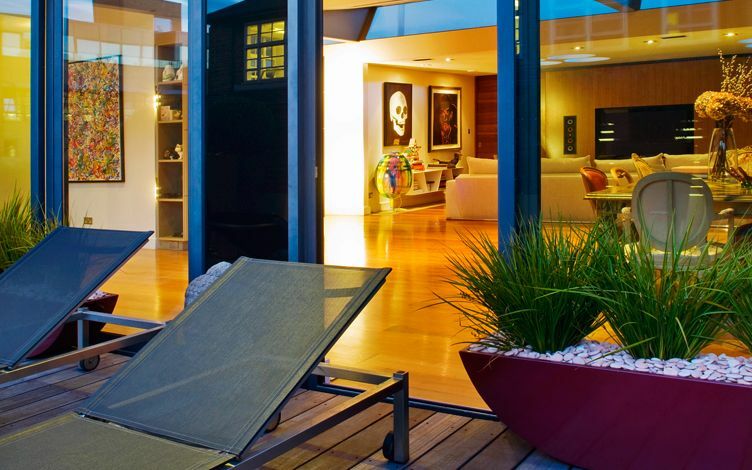 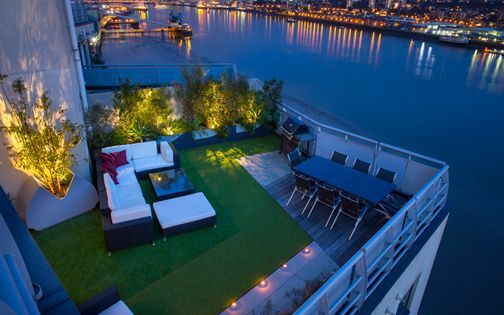 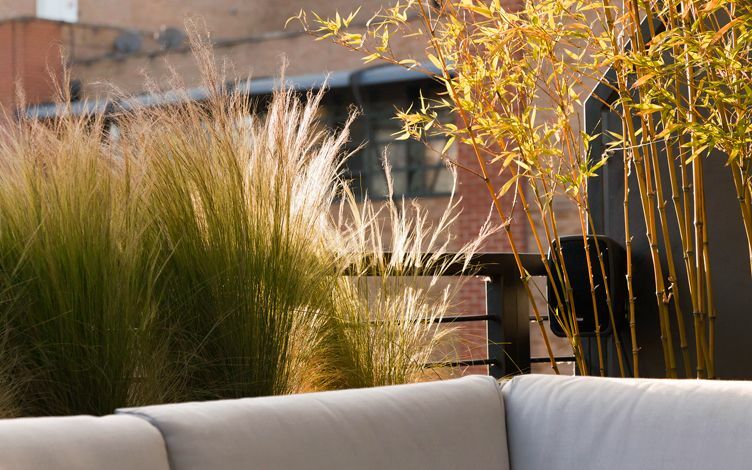 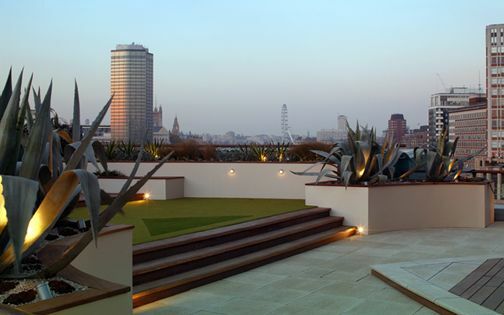 The penthouse's expansive living room is balanced by tall rooftop planters, where two sets of bespoke, tapered planting vessels form a symmetrical composition along the roof terrace's horizontal cladding. 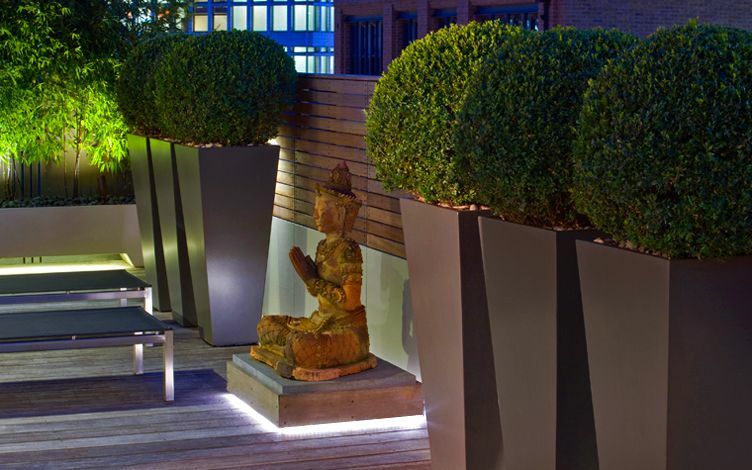 The modern topiary layout design highlights the delicate nuances of a graceful terracotta Buddha statue, enfolding ethnic essence with soft curvature. 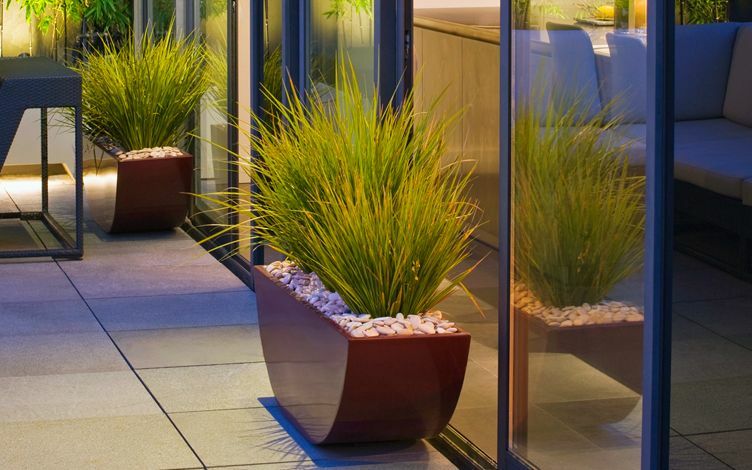 These oversized, custom-made planters produce luminous reflections onto glass elevations and slanting roof eaves – generating pivotal scale at 1.5-metre height. 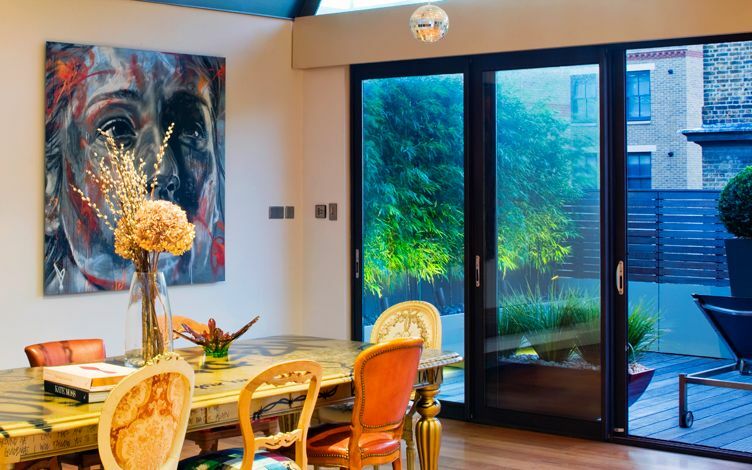 The Buddha extends the apartment's fine art anthology into the roof terrace, forming a central focal point amid a myriad of cultural artefacts. 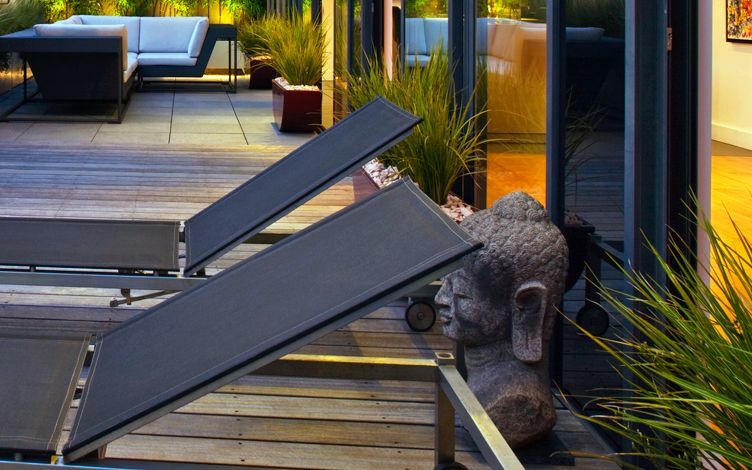 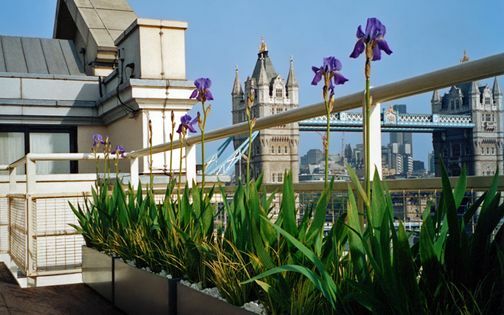 We returned to the penthouse to develop further planting across its various roof terraces, and design & build a display system for an expanding indoor art collection.